The transaction by which Airbus will acquire a majority stake in the C Series Aircraft Partnership was initially announced in October 2017. 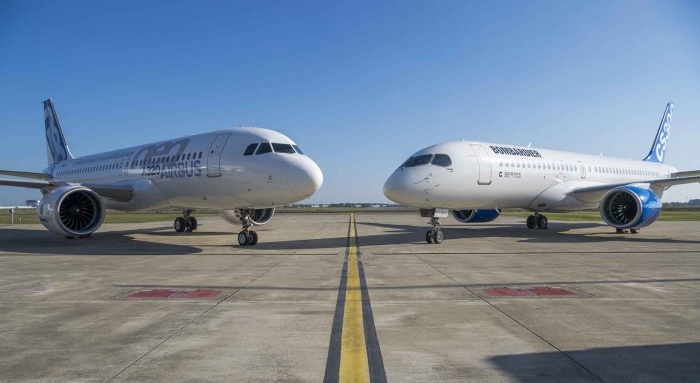 The Mirabel-based partnership, which was originally established between Bombardier and IQ, will benefit from Airbus’ global reach, scale, procurement organisation and expertise in selling, marketing and producing the C Series – a state-of-the-art jet aircraft family in the 100-150 seat market. Airbus will work with its partners Bombardier and IQ to fully unlock the C Series’ potential and create significant new value for customers, suppliers, employees, shareholders and the communities in which the partnership operates. The partnership’s head office, primary assembly line and related functions will be based in Mirabel, Québec. As previously announced, Bombardier will continue with its current funding plan of C Series Aircraft Partnership. Bombardier will fund the cash shortfalls of CSALP, if required, during the second half of 2018, up to a maximum of US$225 million; during 2019, up to a maximum of US$350 million; and up to a maximum aggregate amount of US$350 million over the following two years, in consideration for non-voting participating shares of CSALP with cumulative annual dividends of two per cent. Any excess shortfall during such periods will be shared proportionately amongst CSALP’s Class A shareholders. Airbus will consolidate CSALP effective from July 1st onwards. Further financial information on the transaction will be provided later this year. The C Series program continues to ramp up. Having delivered 17 aircraft in 2017, it is gearing up to double its deliveries in 2018. Airbus chief executive, Tom Enders, said: “This partnership extends our commitment to Québec and to all of Canadian aerospace, and we are very glad to welcome so many C Series teammates into the extended team Airbus. “The strength of the entire Airbus organization will be behind the C Series.